I installed the new distributor and run the engine a short time to confirm the distributor function. It ran good and on all 8 cylinders. However, with several rev ups I noted the fuel pressure drop again. So something is still wrong in the fuel delivery system so that needs to be looked at. Over a period of one year and several attempts to tune the engine it was not possible to keep it running even after warm up when the chokes were turned off. The main jets were drilled out in steps to get the engine to run with the chokes off. The engine finally ran with the chokes off when the main jets were drilled out to .075” and holes in the air correction jet tube that supplies fuel to the main jets were cross drilled through both sides at .075” However, as soon as the RPM was lowered the engine would cut off unless the chokes were pulled a little. Even with the idle mixture screws opened all the way out it still would not run at lower RPM. The idle mixture screws receive their fuel from a fixed idle jet. So the same process of step drilling the idle jets was started. On the second drilling of .045” the engine ran at lower RPM with the chokes off. 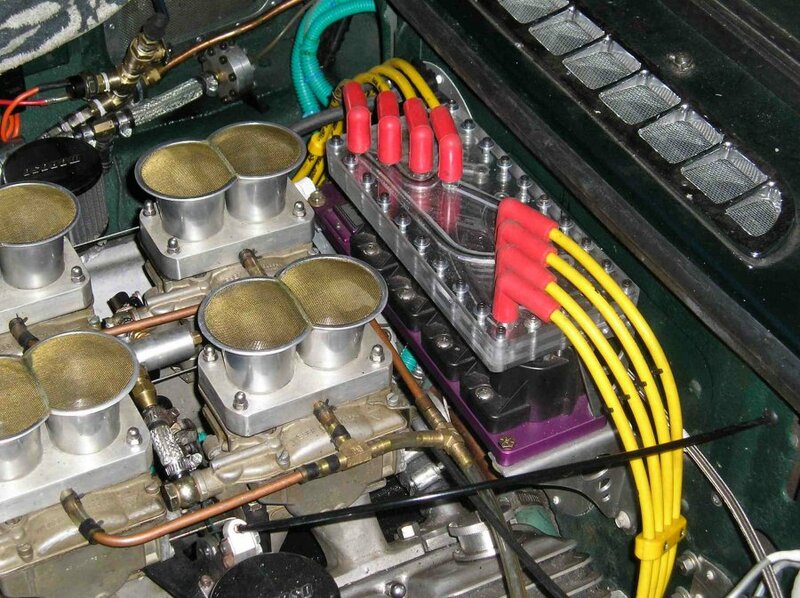 The Weber 40 DCNF carburetors use the fixed jet to supply fuel to the idle mixture screws and to the ports in the walls of the carburetors just after the throttle plates are opened to “Off Idle”. Another problem was noted when the throttle was opened several times. The fuel pressure would drop from 3.5 PSI to below 2 PSI and the engine would stumble and die. 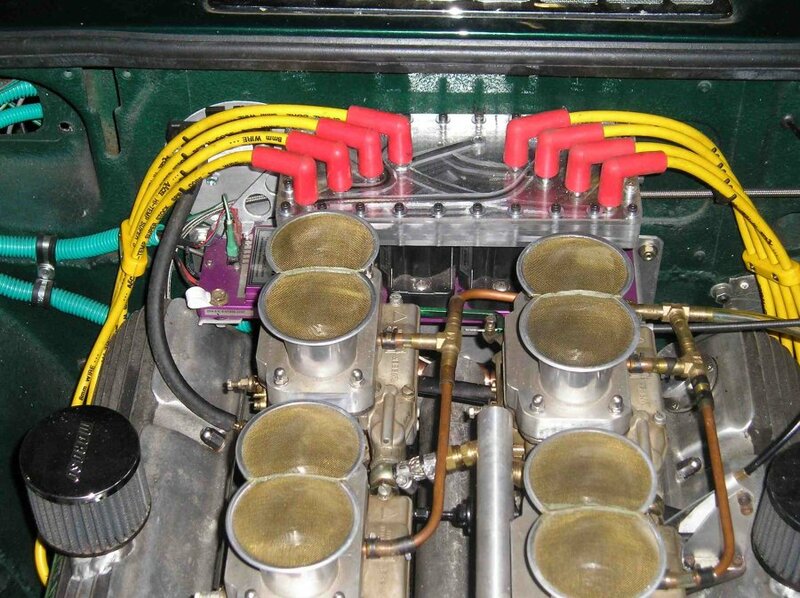 The 308 Ferrari required 5 PSI, so a 5 to 7 PSI pump was installed. However, now when the engine was revved several times the pressure went to zero and the engine died. It was found that the Safety Foam used in the tank was too dense and would not drain sufficient fuel and the pump evacuated all the fuel around the tank pick up. So large groves were cut in the bottom of the foam and a larger area was made around the pick up tube. This corrected the fuel starvation of the pump. It now maintained fuel pressure of 4 PSI when revved several times but the engine still cut off. It did now idle and rev a few times without the chokes, but it still cut off if revved several times. Float levels had been checked more then once but after closely examining the float needle and seat, it was noted that the hole in the float seat to supply fuel to the float chamber was very small. So tests with several drill bits showed that it was between .065” and .070” and the main jets were larger then that. Keeping in mind that the actual area of the seat that was open was much smaller then that unless the floats were all the way to the bottom of the float chamber. So the float seats were starving the jets of fuel. The float needle seats were drilled to .105” (# 37 bit). Float level was at 1.975” and after drilling of needle seats it was at 1.860” due to the needles dropping deeper into the seats. The float level was left at that new setting until after test of just a fuel pump run at 4.5 PSI and at several minutes of engine running and no flooding was noted in the over flow tubes. This will be monitored as tuning continues. I found that the throttle plates were not closing all the way and it had been running on the “Off Idle” circuits. A fixed jet that Weber calls an idle jet controlled the jetting for this circuit. So these were also drilled out. Also the throttle linkage was redesigned so the throttle plates could close all the way and the adjustable idle jets were adjusted. A test run indicated that the engine would now idle. Fuel pressure was now at 4 PSI and a quick rev up indicated a good quick response but several quick rev ups in a row made the fuel pressure drop from 4 PSI down to 2 PSI and the engine then stumbled and tried to die. Two pumps in series were tried and the pressure went to 8 PSI, which is too high so a pressure regulator is ordered, and the two pumps will be mounted permanently in the rear and a pressure regulator will be mounted in the engine compartment as soon as it arrives. A target pressure of 5 to 6 PSI will be tried. The two pumps were installed in series and the pressure regulator was added up front and the preliminary tests show that it is running better now. It will rev cleanly and sharp and only a light puff of black smoke is noted on a quick throttle opening. The DCNF carburetors have adjustable acceleration circuits so this may need minor adjustments. The engine now idles and both the idle stop screws can change idle speed and the idle mixture screws change mixture. Several quick throttle openings show no significant fuel pressure loss. I believe now it is ready for some stationary running and testing of the cooling system. Then a road test to check final tuning. The problem was my assuming that a set of carburetors meant for a 308 Ferrari would be close to what a mildly hopped up 3.5 Olds engine required. My first error was that these carburetors didn’t work correctly on a new 308 Ferrari and that is why they were removed from a new car before the car could be delivered. 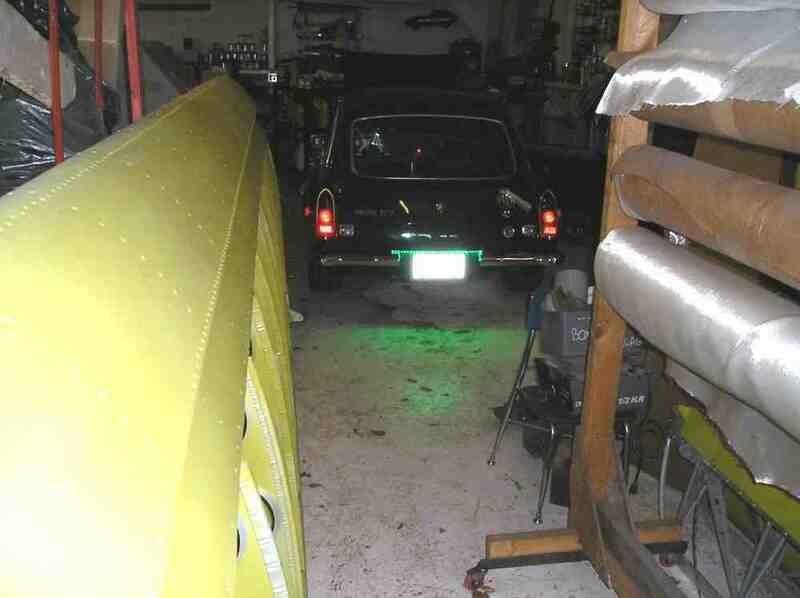 Then I added to the problem because I had no experience with Safety Foam in a fuel tank. Then my problems were compounded when my assumption was wrong that the carburetors could supply sufficient fuel for a modified 3.5 Liter Olds. Or that one aftermarket electric pump could supply sufficient fuel to four carburetors. I was at the last main jet size before the passage ways in the carburetors were going to be the restrictive force which would mean the carburetors could not be used. I am sure that engineers designing an engine like mine could have figured all this out up front, but I had to solve each short fall one at a time as they appeared. But I am confident that it is very close to correct now. I just didn’t expect so many things needed to be corrected. Usually a single problem is easy to ID and correct, but this had many problems in the same area. I was fortunate to have race engine experience that enabled me to find and correct each problem as it appeared. The one fuel pump could supply the pressure but not the volume when the engine was revved up several times. So I installed a second pump in series and put an adjustable pressure regulator in the line. This corrected the problem and now only an actual road test will tell. However, the distributor works and looks good (or at least it matches the monster look of the car). 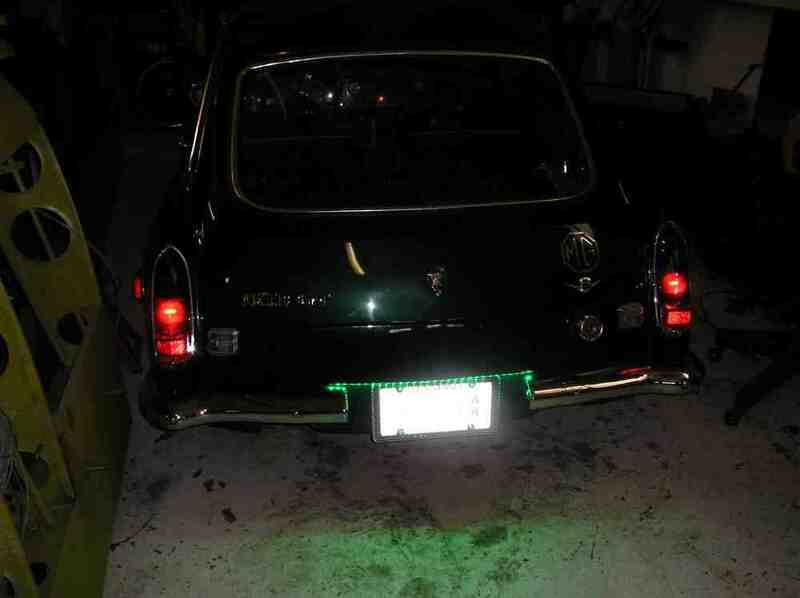 Also, the green LEDs over the license plate are suppose to go on domestic rods but here again I and my car are rebels. Not much more to be done to the car except the headliner and seat belts and a tie down for a tool kit in the trunk. I also need to do something with the exhaust sound so I can drive it on the street. 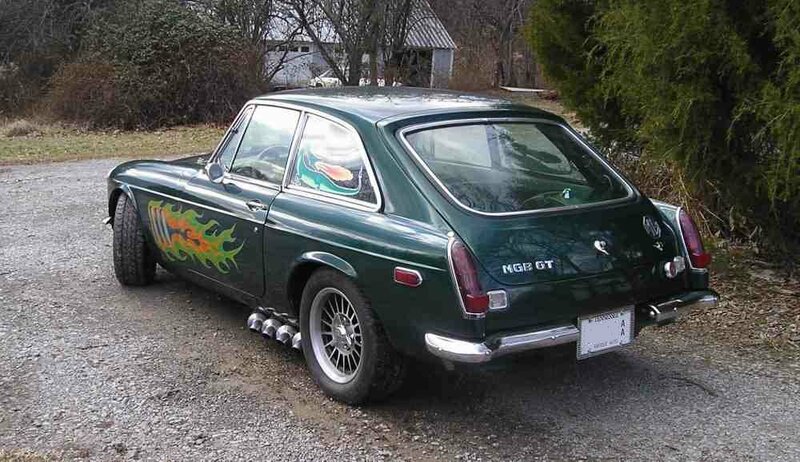 I have named the car "The Green Dragon" and have a green dragon mascot to display with it at car shows. However, I didn't name it for what might seem obvious. 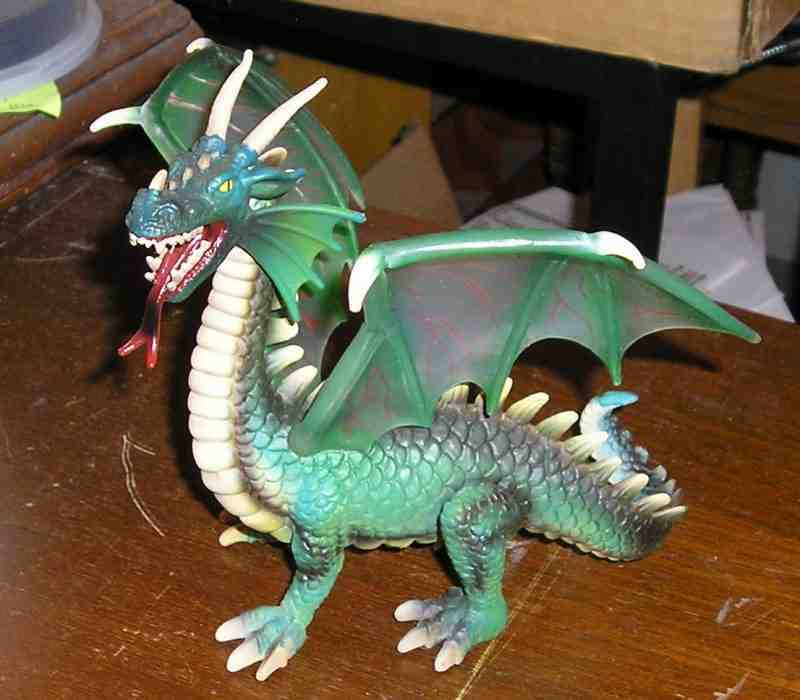 I named it after the "Green Dragon Tavern" in Boston MA. 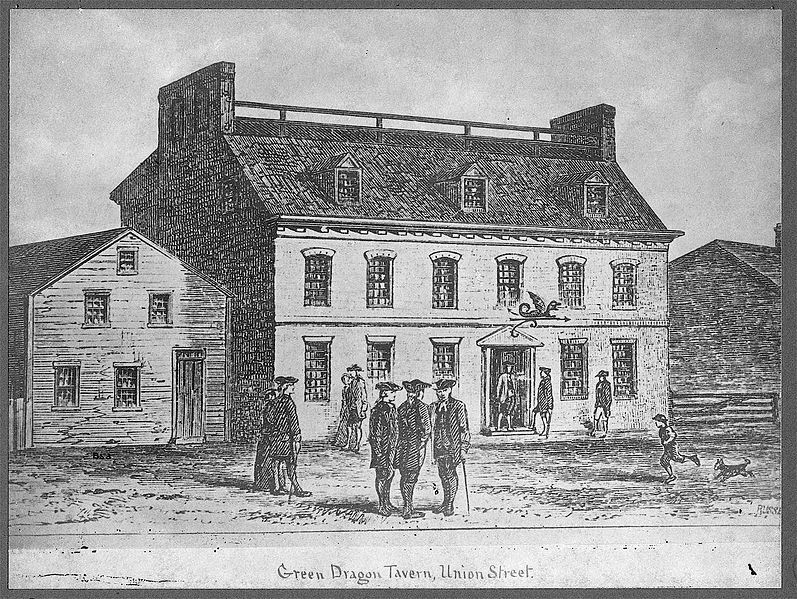 This it the tavern where much of the plans to rebel against England and form a new country started. My car is somewhat a rebel of sort against the normal British sports car. 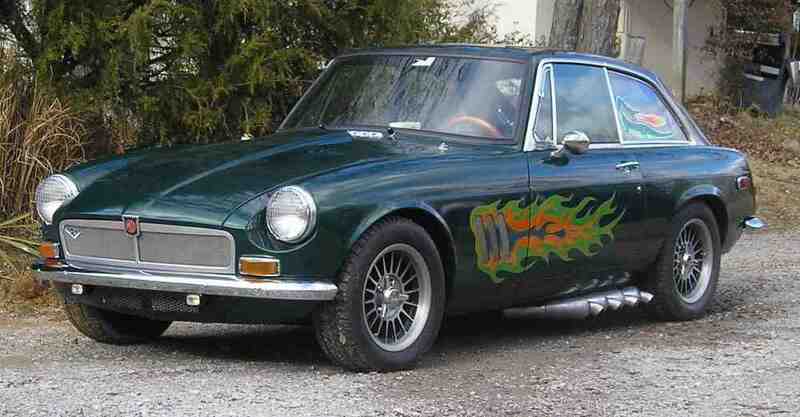 Generally it is taboo to paint flames on a British sports car. Here my car is a "Rebel" against the Crown. Many MG owners insist on OEM parts if possible and for sure not other brand car parts. Here again my car is a "Rebel" against the Crown. With an Olds engine and many other car brand parts like BMW, Jaguar, GMC, Chevy, Ford, Mazda, Toyota, Triumph, Honda, Ferrari and even Kubota. Not to mention all the aftermarket parts and hand made parts. Many of the Rebels that first planned to rebel against the Crown were British and loved their home country. They just didn't like the way they were treated in this new land. I have a British name and love British cars and bikes but I don't like the way they treated my car so I rebelled against the establishment and built the car as I wanted it. And have named it after the Tavern where we hatched the plans to make our country the way we wanted it. Thus my car is named the.